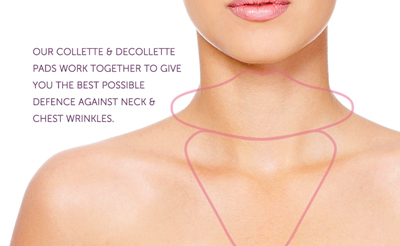 - Designed for the neck where sun exposure, aging and gravity wreak havoc on this area. 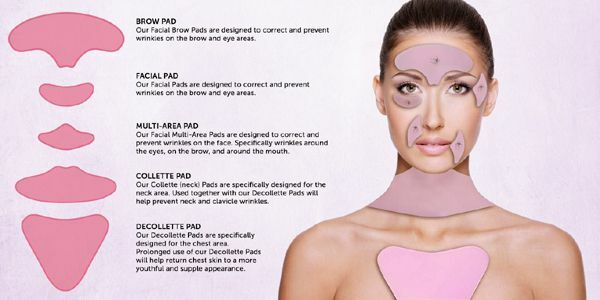 Our Collette pads are specifically designed for the neck where sun exposure, aging and gravity wreak havoc on this area. They are very discreet to wear anytime of day. Made of 100% medical grade silicone, they contain no allergy causing latex, urethanes, or adhesives. Regular washing them with an antibacterial soap or baby shampoo will remove the exfoliated skin cells which can interfere with the adhesive quality of the pad. Another trick after washing them is is to dry it with a hair dryer, as it helps to revive the adhesive. One of our customers says she gets months out of her pad doing this!